Over 560 hand-crafted, intricately detailed parts. Chicago Water Towers are an iconic piece of Chicago's history. Finally, a museum grade scale model exists to preserve the many details and memories associated with this special rig. Museum grade precision and authenticity. Over 18 months of development has been invested in the Chicago Fire Department 1928 Water Tower 1 scale model. Countless hours of design, proofing, and improvements make this replica museum grade. Production of CFD Water Tower 1 will be limited to no more than 300 units. Fire Replicas are designed with the elite collector in mind, and manufactured in limited quantities to enhance future value. Fully custom presentation and protection. The CFD Water Tower 1 measures 9.5"L x 2.25"W x 2.75"T and is securely displayed inside a custom case. The case dimensions are 12"L x 6"W x 5.25"T and the platform includes an etched stainless steel nameplate with the CFD seal, department and truck name. 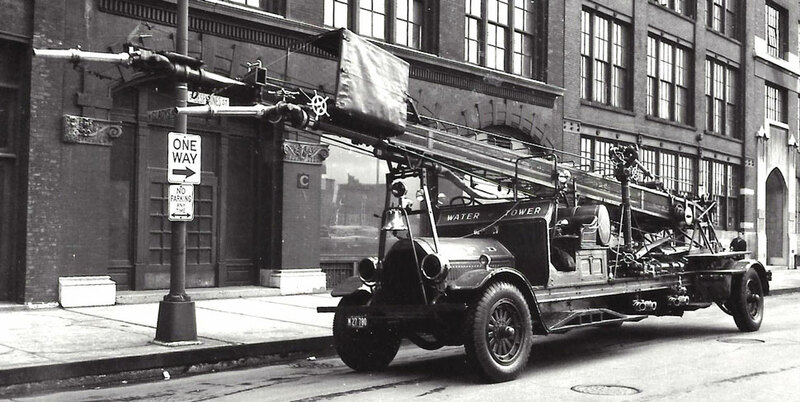 In July of 1928 Seagrave delivered this water tower to the Chicago Fire Department.The CFD required Seagrave to build Water Tower 1 1928 rig similar to the old style radiator and hood so all three Water Towers would look alike. Seagrave changed designs and started making radiator’s and hoods rounded after 1925. This tower came originally with the two turrets on the deck, and the one at the end of the mast. 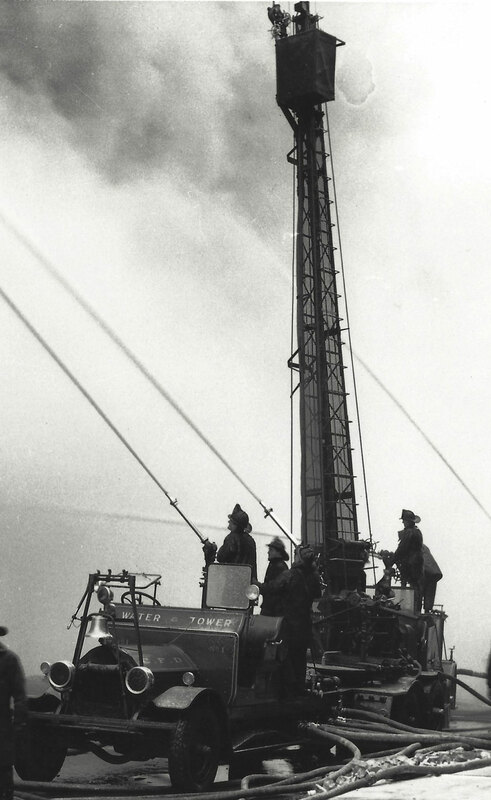 The “Corrigan Pipe” and crows nest were added in 1936 on all three Water Towers. Water Tower 1 moved into a brand new Fire House at 324 S. Des plaines (Engine 5) in October of 1928. The old 1923 Water Tower was moved to the shops and renumbered at put back in service in December as Water Tower 3 at Engine 104’s on 1401 South Michigan Ave. Water Towers. Water Tower 3 served on the front line until 1959 at which times Quinn’s Snorkel were being place in service, The first snorkels were called Water Tower 4 and 5, by May of 59 those were called Snorkels 1 and 2. Snorkel 2 was stationed at engine 5 in April of 1959, in December Water Tower 1 was out of service after 31 years. Water Tower 3 the 1923 Seagrave moved to the far south side in 1959 with Engine 46 until 1961 when it was replaced by Snorkel 6. The 1923 Seagrave Water Tower served on the front line 38 years.The 1925 Seagrave Water Tower was at Engine 14’s from 1925 until July of 1962 serving 37 years. Fire Replicas has done a amazing job replicating these three rigs, persevering the history of the classic trucks that served the City of Chicago over 90 years ago. Each model has the distinct difference of all three rigs, note the hose ramps on the running board of Water Tower. This Chicago Fire Department 1928 Water Tower 1 scale model is a museum grade replica. Like all Fire Replicas models, every detail is modeled to perfection and with razor sharp precision. The replica features the specific department configuration and graphics, leaving no detail overlooked. The display case is custom manufactured with high quality acrylic and resin. The stainless steel etched plate features the department and truck name, and department seal. This replica is a treasure to be displayed and admired and is in no way a toy. Very detailed model. I can see why these models sellout so fast. Fantastic detailed model and the enclosed letter gave it the personal touch, great packaging it arrived safe and well in the UK, will be buying more. Another remarkable version of a very historic piece of apparatus that fought countless fires through several decades in Chicago. This is a true to life version of the actual rig. I was fortunate to see all three of these Seagraves while visiting the CFD as a youngster. This is a rare model indeed! Money well invested!!! Fire Replicas has done a amazing job replicating these three rigs, persevering the history of the classic trucks that served the City of Chicago over 90 years ago. Each model has the distinct difference of all three rigs, note the hose ramps on the running board of Water Tower.